Choose from hundreds of items to screen print or embroider: t-shirts, polos, denims, dress twills and oxfords, jackets, hats, totes, aprons and more! Please note: We do not imprint "Individual Names" for teams. We do carry numbers, 8" high, in black or white only. 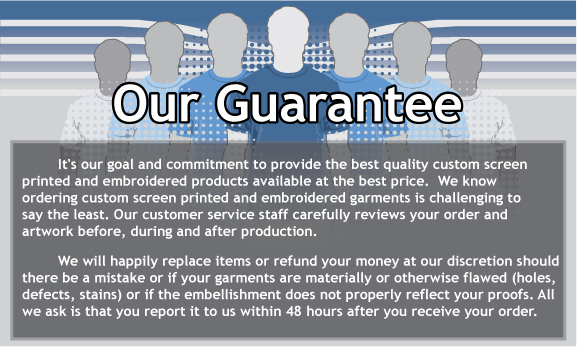 Turn around time is 10 working days or less for custom screen printing or embroidery orders. The minimum order size is 12 items. Click here to get a custom estimate from any item in these wearables catalogs. Especially for items not advailable for quoting on our Instant Quoter.